The Mind Mirror 6 software is unique and unparalleled in its ability to reflect the activities of the brain and consciousness. The software comes with sophisticated features, innovative user controls, advanced data analysis, and a revolutionary at-home self-training program. The self-training program, consisting of audio cues, helps the brain orchestrate the ideal Awakened Mind pattern shown at right and other time-proven patterns which increase mental clarity, creativity, insight, intuition, spiritual awareness, and personal growth. Utilizing the band pass filters and composite display pioneered in 1976 by English biophysicist C. Maxwell Cade, the Vilistus Mind Mirror 6 has advanced the original Mind Mirror with the best of neurofeedback and biofeedback technology. The software is customized to the needs of Awakened Mind practitioners, self-trainers, and researchers around the world. Our biotechnology is continually growing, evolving, and receiving accolades and awards. What makes the Mind Mirror so unique? allows self-trainers to hook up and relax while their brains adjust to audio cues for selected patterns which scientifically develop the power and potential of the brain and consciousness. The Mind Mirror's clear, accurate reflection of brain activity and states of consciousness led to its 2016 and 2017 awards as a Transformative Technology contributing to the mental and emotional well-being of humanity. Over the past 40 years, the Mind Mirror has been the global leader in consciousness research and development. Today, the Mind Mirror 6 is used by self-trainers and practitioners associated with the Institute for the Awakened Mind to help bring about personal and planetary transformation. What can this software do for me? Is it too complex for a non-technical person? The Mind Mirror 6 is easy to operate: just a few keystrokes and you're in full command of the software. We provide a comprehensive user manual, self-training guide, online instructional videos, and monthly webinars with a vibrant online community of Mind Mirror owners. Classic and new views with an optional gamma screen. 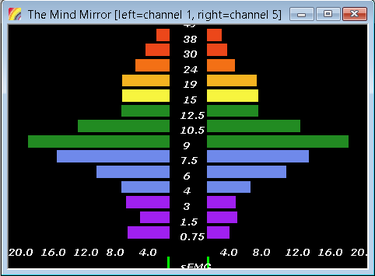 The classic Mind Mirror pattern (below, left) consists of 14 frequency bars inclusive of 0.5-44 hertz, or cycles per second. This range can be extended with a keystroke command to either 64Hz or to 100Hz (below, right). The display can be changed to any color or combination of colors or appear in an outline with or without the frequency bars. The white numbers below the brainwave display show the amplitude, or power, of the frequencies. This attenuation setting is easily adjusted with a keystroke command or right-click auto-attenuation command. The green surface Electromyography (sEMG) bar below the microvoltage settings alerts the meditator to the appearance of frequency-distorting muscle artifact in the head, neck or shoulders. Various data display windows are shown below. 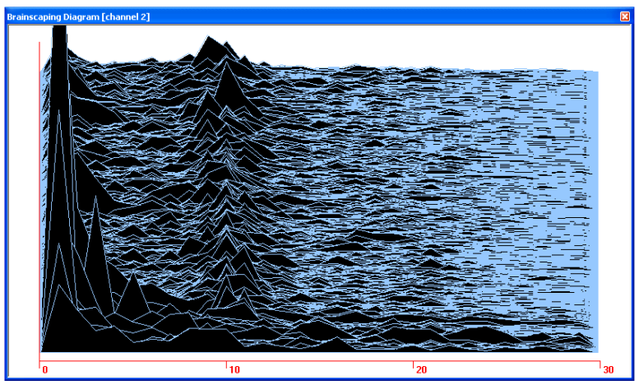 Black or white canvas, with amplitude summary windows. 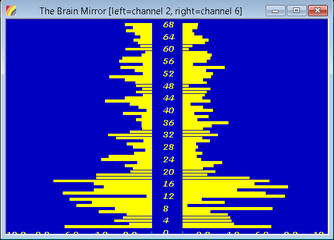 Single-frequency Brain Mirror extends up to 100Hz. The Galvanic Skin Response (GSR) and Blood Volume Pulse (BVP) sensors included in the Practitioner Kit and shown on the Hardware page are used to monitor and self-regulate physiology. Used alone or in combination with EEG, the GSR and BVP sensors deepen understanding of the body-mind connection and how to profoundly relax in order to reduce stress, improve health, and expand awareness. The GSR can be used without EEG to extrapolate the Meditation, Awakened Mind, and Evolved Mind patterns, due to Max Cade's correlation of ESR/GSR measurements with brainwave production. 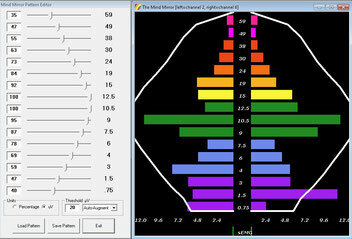 The screen capture below shows Lesh State 5 and its associated Awakened Mind brainwave pattern. Post-session summary view windows for GSR and BVP enable the user to correlate mind-body relationships and master each. The red trend lines and vertical white markers, used in conjunction with a second timer clock, precisely pinpoint notable events in the body for correlation with EEG. Session markers can be associated with internal landmarks for greater self-understanding and self-mastery. 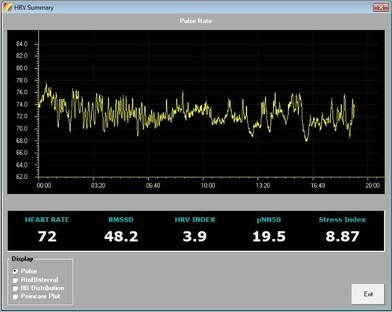 The BVP sensor maps pulse rate, heart-rate variability, and stress index. With the add-on Mind Mirror Features Pack, the BVP sensor and Pacer identify the best HRV Resonant Frequency for the heart and breath. Resonant frequency breathing reduces stress, optimizes consciousness, and improves health. 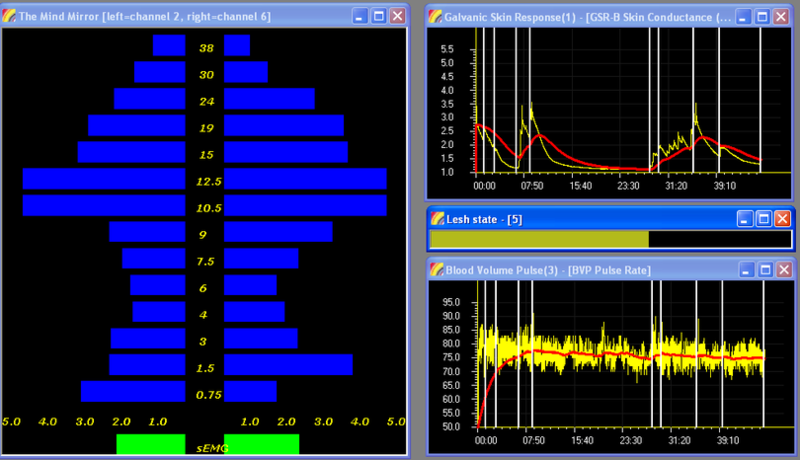 BVP summary window shows Heart Rate, HRV Index, and Stress Index. The Mind Mirror's self-training program provides direct audio-visual feedback for training a variety of programmed patterns. New meditators may wish to begin with preliminary patterns such as Beta Reduction, Alpha Generation, Alpha Synchrony, Alpha-Theta, or Delta Generation. 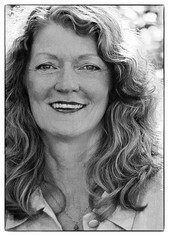 Advanced meditators train the Awakened Mind, Enhanced Awakened Mind, Evolved Mind, and Gamma Synchrony patterns. Purchase of the separate Mind Mirror Features Pack allows users to design their own patterns up to 100Hz (see graph below). Self-trainers simply attach the electrodes, select the pattern to be trained, activate the white outline, and press Record. The brain adjusts itself to attain the audio rewards and pattern. 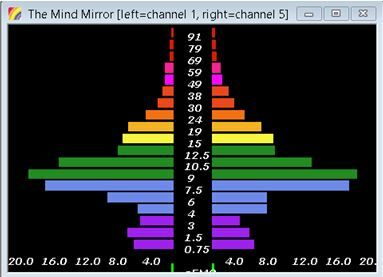 The Mind Mirror Summary brainwave display shown above and in a close-up below is an average of the amplitudes of each frequency bar for the whole session or a segment of it. The Training Summary's Statistical Column Chart tracks pattern attainment scores for 10 variable challenge levels and suggests your best training level. 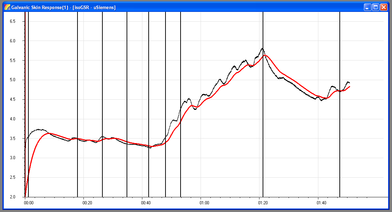 The Summary Plot shows on a timeline and by clicking on the dot precisely when patterns were attained. The above graph shows an Evolved Mind training session (the circular white outline) in a Mind Mirror window with two bands of gamma (44-64 Hz). 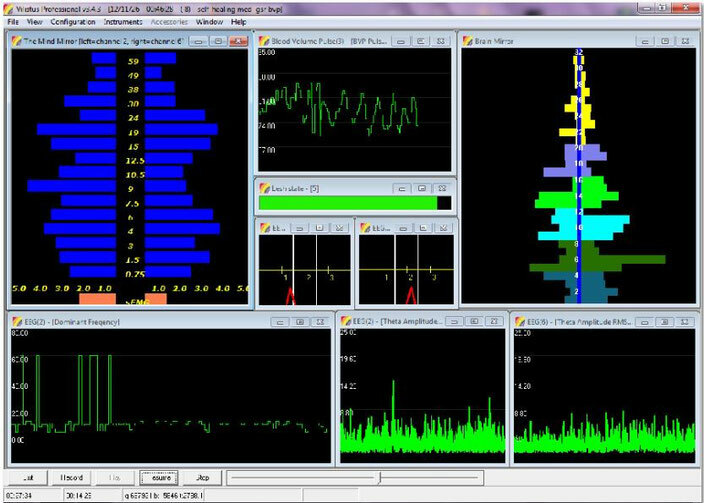 Spectrograms track the array of frequencies. 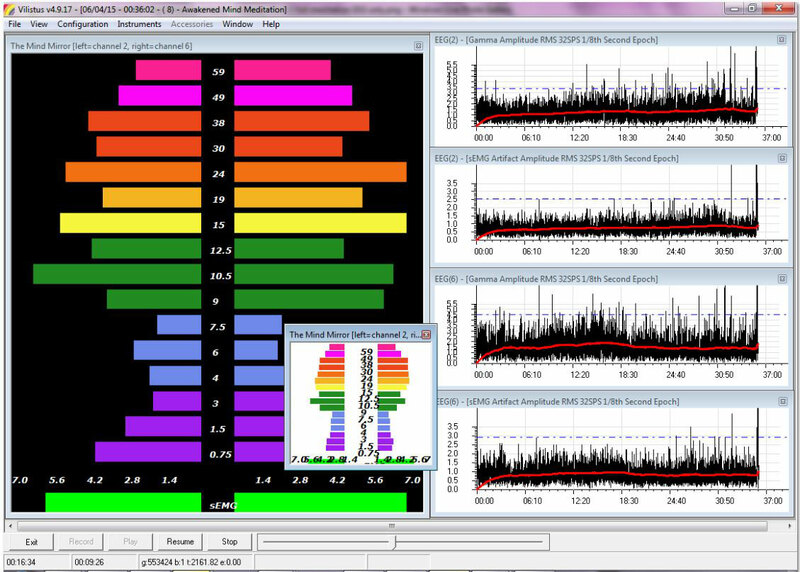 At top left and right, post-session Gamma Amplitude summary windows (35-45Hz) show a distinct gamma-wave increase, identified by a rise in the red trend line. Signal Quality stoplights alert the meditator to issues with sEMG artifact, 60Hz noise, and Signal Quality reductions before the eyes-closed session begins. Direct audio-visual feedback helps the meditator find internal landmarks, or anchors, used to re-create the state of consciousness. Re-imagining internal landmarks and viewing the training pattern's white outline with the eyes open teaches the meditator to maintain the ideal Awakened Mind pattern of lucid awareness in waking life. Pattern Editor. The Pattern Editor is included in the optional Mind Mirror Features Pack. It allows the user to design any self-training pattern. Simply move the lever in the instrument panel to define the shape of the pattern. Musical cues sound when the pattern ratios are met. Includes options to augment or inhibit (increase or decrease) specific amplitudes. Auto-augment and auto-inhibit take a two-minute measurement and comfortably bring you up to 70% pattern reward levels. 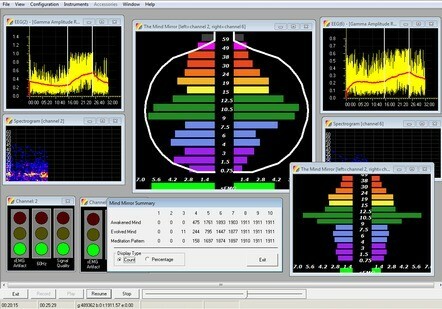 In addition to individual post-session summary amplitude windows for beta, alpha, theta, delta, and low, mid, and upper gamma, the Mind Mirror 6 software offers a quick overview of brainwave activity in the Composite Summary. Composite Summaries shows the interrelationships of the categories of consciousness. The amplitude scale is on the left. Below, note the drop-offs in alpha (green) and several peaks in gamma (the three data lines at bottom), especially toward the end of the session. The horizontal numbers are the time plot. 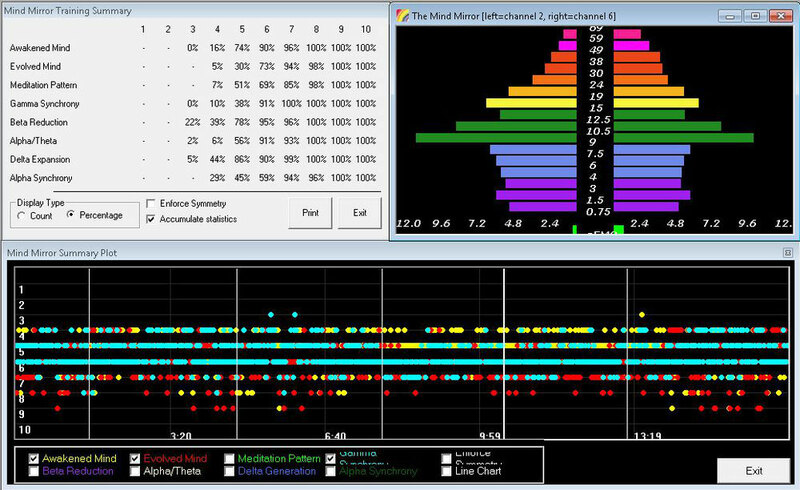 The adjustable Brainscape Plot, with its frequency scale at bottom, shows brainwaves as what they are: waves in a sea of energy. The blue waves shown below can be changed to any RGB color. Keystroke commands increase or decrease the viewing range. Coherence Reports, available with purchase of the optional Mind Mirror Features Pack, measure interhemispheric amplitude symmetry, a key component of peak performance. In addition to a Brain Symmetry graph and a Correlation Coefficient window which shows the 1-100Hz frequencies with the greatest levels of coherence, Coherence Summaries for each brainwave category track coherence throughout the session. The Coherence Summary shown below is for Mid Gamma (44-64Hz). The rising red trend line indicates that Mid Gamma coherence increased toward the high-coherence value of 0.7 as the meditation progressed. The Mind Mirror 6 facilitates group brainwave training with affordability and ease. Four inputs in the Vilistus digital sampling unit accommodate up to four EEG sensors or a mix of EEG and physiology sensors. 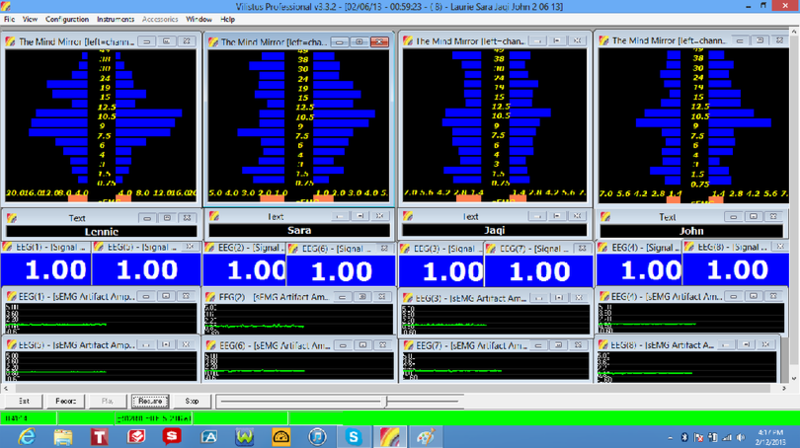 The screen capture below shows four people hooked up to one Vilistus DSU simultaneously. Instrument windows include the Mind Mirror, signal check instruments showing the optimal 1.00 reading, and separate sEMG Artifact windows. Each of the four Mind Mirror windows can be adjusted in the many ways explained here and on the User Controls page. Designed for neurofeedback therapists, the Viistus Pro foundation of the Mind Mirror 6 offers standard and quick protocols. Direct audio-visual feedback is available, along with windows showing raw data and formats including vertical bars and bar graphs for 2-45 Hz, Gamma, Beta, Alpha, Theta and Delta Amplitude, SMR, Alpha-Theta, and Theta-Beta. The red arrows in the left- and right-brain alpha-theta windows shown below indicate whether or not the client's brainwaves are in compliance with the selected ratios. The most commonly used Neurofeedback Protocols are programmed into the software and can be adjusted easily with the Quick Protocol feature. The Clinical Q, an add-on feature, is a mini-QEEG. Neurofeedback therapists can request substitution of the Mind Mirror's dual-channel EEG leads for two single-channel EEG leads. Our software developers work closely with worldwide self-trainers, Awakened Mind practitioners, and consciousness researchers to develop new features that advance and enhance the software and the experiences of users. Software updates are provided free of charge. Software support includes comprehensive manuals, videos, webinars, and 24/7 online help. All hardware is warrantied under fair-use terms for two years.